Review by AllTheBestFights.com: 2019-03-02, pretty good fight between Jeremy Stephens and Zabit Magomedsharipov: it gets three stars. Jeremy Stephens entered this fight with a record of 28-15-0 (75% finishing rate) and he is ranked as the No.7 featherweight in the world (currently the #1 in this division is Max Holloway) but he comes off the loss against Jose Aldo (Jose Aldo vs Jeremy Stephens); before this bout, in 2018, he had beat Josh Emmett in February (Josh Emmett vs Jeremy Stephens) and Doo Ho Choi in January (Jeremy Stephens vs Doo Ho Choi). His opponent, Zabit Magomedsharipov, has a mma record of 16-1-0 (81% finishing rate) and he entered as the No.30 in the same weight class. He suffered his only loss when he faced Igor Egorov in 2013, since then he has won twelve consecutive bouts beating Kyle Bochniak (Zabit Magomedsharipov vs Kyle Bochniak) and Brandon Davis in 2018 (Zabit Magomedsharipov vs Brandon Davis). Stephens vs Magomedsharipov is on the undercard of Jon Jones vs Anthony Smith – UFC 235. Watch the video and rate this fight! 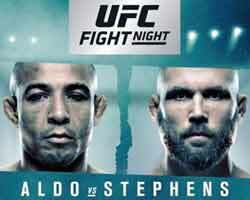 Review by AllTheBestFights.com: 2018-07-28, nice and tough exchanges between Jose Aldo and Jeremy Stephens: it gets three stars (UFC Performance of the Night). The black belt in Brazilian jiu-jitsu and former Ufc Fw champion Jose Aldo entered this fight with a pro mma record of 26-4-0 (62% finishing rate) and he is ranked as the No.3 featherweight in the world but he comes off two consecutive defeats, both against current #1 Fw Max Holloway (Aldo vs Holloway I and Max Holloway vs Jose Aldo II); before these two bouts, in 2016, he had beat Frankie Edgar (Edgar vs Aldo 2). His opponent, Jeremy Stephens, has a record of 28-14-0 (75% finishing rate) and he entered as the No.5 in the same weight class. He lost two consecutive fights between 2016 and 2017, against Frankie Edgar (Edgar vs Stephens) and Renato ‘Moicano’ Carneiro (Stephens vs Moicano) but then he has won three bouts beating Josh Emmett in his last one (Josh Emmett vs Jeremy Stephens). 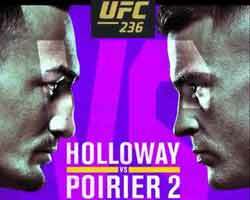 Aldo vs Stephens is on the undercard of Eddie Alvarez vs Dustin Poirier 2 – UFC on Fox 30. Watch the video and rate this fight! 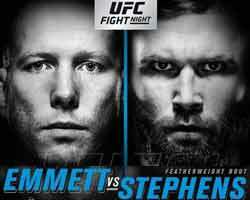 Review by AllTheBestFights.com: 2018-02-24, pretty good fight between Josh Emmett and Jeremy Stephens: it gets three stars (UFC Performance of the Night). Josh Emmett entered this fight with a pro mma record of 13-1-0 (46% finishing rate) and he is ranked as the No.5 featherweight in the world (currently the #1 in this division is Max Holloway). He fought three times in 2017 losing to Desmond Green but then he beat Felipe Arantes and Ricardo Lamas (Ricardo Lamas vs Josh Emmett). His opponent, Jeremy Stephens, has a record of 27-14-0 (74% finishing rate) and he entered as the No.8 in the same weight class. He lost two consecutive fights between 2016 and 2017, against Frankie Edgar (Edgar vs Stephens) and Renato ‘Moicano’ Carneiro (Stephens vs Moicano) but then he has beat Gilbert Melendez (Stephens vs Melendez) and Doo Ho Choi (Jeremy Stephens vs Doo Ho Choi). Stephens vs Emmett is the main event of UFC on Fox 28. Watch the video and rate this fight! 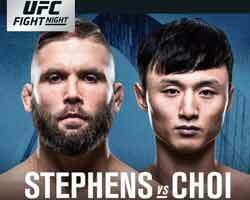 Review by AllTheBestFights.com: 2018-01-14, good exchanges between Jeremy Stephens and Doo Ho Choi: it gets three stars (UFC Fight of the Night). Jeremy Stephens entered this fight with a professional mma record of 26-14-0 (73% finishing rate) and he is ranked as the No.8 featherweight in the world (currently the #1 in this division is Max Holloway). He lost two consecutive fights between 2016 and 2017, against Frankie Edgar (=Edgar vs Stephens) and Renato ‘Moicano’ Carneiro (=Stephens vs Moicano) but then he has beat Gilbert Melendez (=Stephens vs Melendez). His opponent, Doo Ho Choi, has an official record of 14-2-0 (86% finishing rate) and he entered as the No.26 in the same weight class. He fought twice in 2016 defeating Thiago Tavares (=Tavares vs Choi) and losing to Cub Swanson (4-stars fight, Swanson vs Choi). Stephens vs Choi is the main event of UFC Fight Night 124. Watch the video and rate this fight! Review by AllTheBestFights.com: 2017-09-09, tough fight but not so exciting: Jeremy Stephens vs Gilbert Melendez gets two stars (UFC Fight of the Night). Jeremy Stephens entered this fight with a pro record of 25-14-0 (76% finishing rate) and he is ranked as the No.14 featherweight in the world but he won just one out of his last four bouts, against Renan Barao (=Barao Pegado vs Stephens). After this fight he has lost to Frankie Edgar (=Edgar vs Stephens) and Renato ‘Moicano’ Carneiro (=Stephens vs Moicano). His opponent, the black belt in Bjj and former Strikeforce Lw champion Gilbert Melendez, has an official mma record of 22-6-0 (55% ko/tko victory rate – he has never won via submission) and he entered as the No.46 lightweight but he comes off three consecutive losses, against Anthony Pettis in 2014 (=Pettis vs Melendez), Eddie Alvarez in 2015 (via split decision, Melendez vs Alvarez) and Edson Barboza in 2016 (=Barboza vs Melendez). Jeremy Stephens vs Gilbert Melendez is on the undercard of Amanda Nunes vs Valentina Shevchenko 2 – UFC 215. Watch the video and rate this fight! 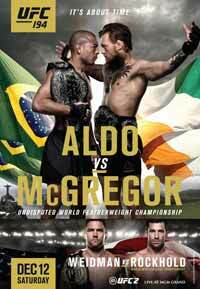 Review by AllTheBestFights.com: 2017-04-15, fight not particularly good between Jeremy Stephens and Renato Moicano Carneiro: it gets two stars. Jeremy Stephens entered this fight with a record of 25-13-0 (76% finishing rate) and he is ranked as the No.7 featherweight in the world (currently the #1 in this division is Jose Aldo). He fought twice last year beating Renan Barao (=Barao Pegado vs Stephens) and losing to Frankie Edgar (=Edgar vs Stephens). His opponent, the undefeated Renato Moicano Carneiro, has an official record of 10-0-1 (50% submission victory rate – he has never won via ko/tko) and he entered as the No.48 in the same weight class. He fought just once last year winning over Zubaira Tukhugov. Jeremy Stephens vs Renato Carneiro is on the undercard of Demetrious Johnson vs Wilson Reis – UFC on Fox 24. Watch the video and rate this fight! Review by AllTheBestFights.com: 2016-05-29, nice exchanges between Jeremy Stephens and Renan Barao: it gets three stars (UFC Fight of the Night). The black belt in Brazilian jiu-jitsu and former Ufc Bw champion Renan Barao Pegado entered this fight with a professional mma record of 33-3-0 (70% finishing rate) and he is ranked as the No.4 bantamweight in the world (currently the #1 in this division is Dominick Cruz) but he lost two out of his last three bouts, both against TJ Dillashaw (=Barao vs Dillashaw I and Dillashaw vs Barao II), between these two fights he beat Mitch Gagnon (=Barao vs Gagnon). His opponent, Jeremy Stephens (black belt in Bjj as well), has an official record of 24-12-0 (79% finishing rate) and he entered as the No.12 featherweight. He fought twice last year beating Dennis Bermudez (=Bermudez vs Stephens) but then he lost to Max Holloway (=Holloway vs Stephens). 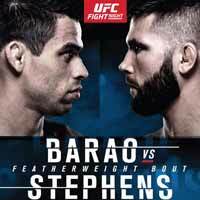 Barao vs Stephens is on the undercard of Thomas Almeida vs Cody Garbrandt – UFC Fight Night 88. Watch the video and rate this fight! Review by AllTheBestFights.com: 2015-12-12, some good single shots between Max Holloway and Jeremy Stephens but it is not enough to get three stars: it gets two. Max Holloway entered this fight with a pro record of 14-3-0 (57% finishing rate) and he is ranked as the No.4 featherweight in the world (currently the #1 in this division is Jose Aldo). He suffered two consecutive defeats in 2013, against Dennis Bermudez and Conor McGregor (=McGregor vs Holloway), but then he has won seven bouts beating Cub Swanson (=Swanson vs Holloway) and Charles Oliveira in his last two (=Holloway vs Oliveira). His opponent, Jeremy Stephens, has an official mma record of 24-11-0 (79% finishing rate) and he entered as the No.11 in the same weight class. He also lost two consecutive fights, against Cub Swanson (=Swanson vs Stephens) and Charles Oliveira in 2014 (=Stephens vs Oliveira), but he came back to win in 2015 defeating Dennis Bermudez (=Bermudez vs Stephens). Holloway vs Stephens is on the undercard of Jose Aldo vs Conor McGregor – UFC 194. Watch the video and rate this fight! Review by AllTheBestFights.com: 2015-07-11, good fight with a spectacular finish Dennis Bermudez vs Jeremy Stephens is close to get four stars! Dennis Bermudez entered this fight with a mma record of 14-4-0 (50% finishing rate) and he is ranked as the No.14 featherweight in the world. He fought three times last year beating Jim Hettes and Clay Guida (=Guida vs Bermudez) but then he lost to Ricardo Lamas (=Bermudez vs Lamas). His opponent, Jeremy Stephens, has an official record of 23-11-0 (78% finishing rate) and he entered as the No.17 in the same weight class but he comes off two consecutive defeats: against Cub Swanson (=Swanson vs Stephens) and Charles Oliveira (=Stephens vs Oliveira). 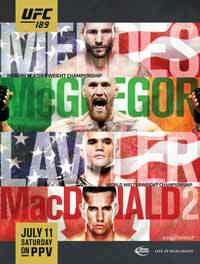 Bermudez vs Stephens is on the undercard of Chad Mendes vs Conor McGregor – UFC 189. Watch the video and rate this fight!